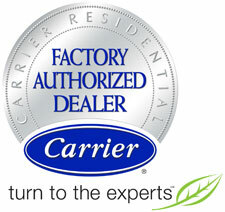 With Carrier products, we offer many different kinds of heat pump configurations. The most common is what’s called a split system. This simply means that your solution will have components that reside both inside and outside your home. The heat pump itself sits in your yard like a central air conditioner unit. Inside your home an evaporator coil to convert refrigerant and a blower motor to move the treated air is needed. Often this is a combination of your furnace attached to an evaporator coil, but sometimes, only a fan coil is used for both functions. From our economical Carrier Comfort Series to the famed Infinity Series Heat Pumps with Greenspeed Intelligence to our Ductless Systems, you can rest assured you are receiving precision heating and cooling, unwavering comfort, uncompromising energy efficiency and ultra-quiet performance. Infinity Series offer Energy Star Qualification and all heat pumps can be a part of a revolutionary Hybrid Heat dual fuel system, to save you money year-round. Round off your system with the innovative Infinity Touchpad Smartphone enabled control for your highest degree of comfort management.